Every technology has limitations and drawbacks. In the case of home entertainment systems, a drawback is the need to organize and manage a collection of videos and dvds. Even when many videos are borrowed, rather than owned, we’d like to be able to track what we’ve seen, make a wish list, assign our own ratings, and create notes about particular movies. Ever stand in a video store with dvd in hand and wonder whether you already own that particular title? The solution is a system for cataloging—but the system must be easy to use; that is, it must take advantage of what we already know. Software developers Mitch and Jim Haileare creating such a system—a web site called Take11.com where users can catalog their video collections. Take11 is a web service: there is no software to buy, download, or update. Anyone who can use a web browser can use Take11. 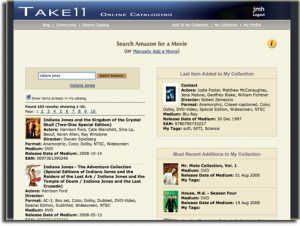 If you have a web-enabled mobile phone, you can access Take11 remotely, such as from your local dvd store. To add to your collection, you input just three or four key terms, and Take11 will fill in many details: actors, director, studio, running time—even a cover image. You can then add your own tags, comments, and ratings. As the number of Take11 users grows, so will its database, and this will allow users to explore other collections and search for little known gems from the film industry. Take11 has just been released for public beta-testing: the developers need users who will explore the site, test features, and give constructive feedback. Anyone who regularly watches videos at home should give Take11 a look. Mitch Haile earned a degree in computer science from The College of Wooster. He has been employed by Motorola and several Silicon Valley startups. Currently he is a freelance software engineer based in Boston. Jim Haile earned an engineering degree from Vanderbilt and a PhD in engineering from the University of Florida. He has twenty-four years experience teaching science, engineering, and computer programming. Currently he resides in upstate South Carolina, where he is a freelance technical writer, editor, and web developer. Their site is in public beta testing and developments can be followed on Twitter. Tracesmart is once again working with programme makers aiming to reunite missing friends and find relatives. The Alan Titchmarsh show, which is produced by Spungold TV, is appealing for people wishing to be reunited with someone in their life, and Tracesmart has been enlisted to help with the search. The production team is eager to feature emotional or uplifting reunited stories on the show as part of their Christmas programming. The Alan Titchmarsh Show broadcasts on the ITV network in the afternoons, and is presently in its third series. The programme infuses real life stories, celebrity guests with everyday advice, and topical subject matter. The show also features a new debate everyday that is examined and discussed with guests which viewers are encouraged to participate. The Christmas shows will aim to feature some of the families that Tracesmart are able to reunite and also appeals for assistance with traces that may require the help of viewers. 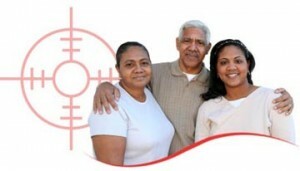 “Tracesmart is regularly contacted by individuals needing help to find relatives or friends, and customers are suprised that through a simple address search using our electoral rollsearch facility they find the missing person is still at the same address,” comments Louise Hewlett, the PR and Trace Co-ordinator at Tracesmart. Previously, Tracesmart has helped with stories for the hugely successful BBC daytime programme ‘Missing Live’. The series followed the work of the police and the charity Missing People in their efforts to uncover the whereabouts of hundreds of individuals every year. The programme makers also wanted to feature family reunions that had recently taken place, and highlight the difficulties some individuals encounter as they search to find the missing person. Tracesmart Limited – Since the launch of its website in 2004 Tracesmart Limited has established itself as one of the UK’s leading providers of online people tracing tools.www.tracesmart.co.uk combines state of the art search technology with an extensive collection of consumer data, providing one of the most powerful and successful systems to trace people. According to Artmotion, it is no secret that Switzerland is becoming a main attraction for high security server applications. During the last few months the company has came across many US customers seeking for unlimited dedicated server solutions with a high secure datacenter location. The partnership with many international upstream providers allows Artmotion to deliver 10 Mbit/s Dedicated Server including unlimited traffic at extremely cost-efficient price. Artmotion Ltd allows the customers to host their IT infrastructure as well as their Website on a secure offshore location. According to the company, Switzerland has a central European location and offers many benefits such as an extremely low risk of natural disasters (hurricanes, earthquakes etc.) and a high level of privacy protection. Founded in 2000, Artmotion Ltd is a privately held offshore Internet Solutions Provider. The company provides a full range of Internet-based solutions focused on small and medium businesses. Artmotion has offices in Zug – Switzerland as well as in London – England. Its data center operations are located in a highly secure Swiss offshore location. The datacenter is multi homed and connected to 17 different peerings and providers, enabling the company to offer a 99,9% network uptime guarantee.